Just in time for the Moscow performance of N. A. Popora's opera Germanico in Germania, the CD made it to the ICMA finals! On December 17th, 2018, Max Emanuel Cencic is excited to sing the title-role of Nicola A. Porpora's great opera Germanico in Germania at Moscow's Tchaikovsky Hall. Max is very much looking forward to working with great collegues and artists like Julia Lezhneva as Ersinda, Nian Wang as Arminio, Dilyara Idrisova as Rosmonda, György Hanczar as Segeste, and Hasna Bennani as Cecina. Max is keen to perform with capella cravoviensis on period instruments under the baton of Jan Tomasz Adamus. Performances as Nerone in L’Incoronazione di Poppea at the Staatsoper Unter den Linden in Berlin had to be canceled! Unfortunately, Max Emanuel Cencic has caught a cold and will have to give his voice a rest. Therefore he, with a heavy heart, has decided to cancel his performances as Nerone at the Staatsoper Unter den Linden. Max was looking forward to resuming this role and to meeting again with his Berlin audience. Alas, it is not to be. Max Emanuel Cencic apologizes to his devoted audience, sends his best wishes to his fans and is dedicated to singing for them again soon. He wishes his colleagues in the Poppea team successful performances. On November 2nd, 2018, Max Emanuel Cencic will perform his (partly) new program Bach&Zelenka in the Cathedrale de Lausanne, accompanied by Nuovo barocco conducted by Dimitris Karakantas. The producer is Parnassus Arts Productions. The new production of La Donna del Lago, staged by Max Emanuel Cencic and conducted by George Petrou at the Opera de Lausanne, will be broadcasted LIVE on Arte TV under the following Link: https://www.arte.tv/fr/videos/082274-001-A/la-donna-del-lago-de-rossini on April 27, 7.55 pm CET. The link will be available for six months. CD Porpora honoured with a Diapason d'Or! In its April 2018 issue, the French opera magazine Diapason has honoured Max Emanuel Cencic's newly released CD Porpora Opera Arias, dedicated to the memory of the great composer Nicola Porpora during the 250th anniversary of his death, with their prestigious Diapason d'Or. CD Germanico in Germania awarded a Diapason d'Or! 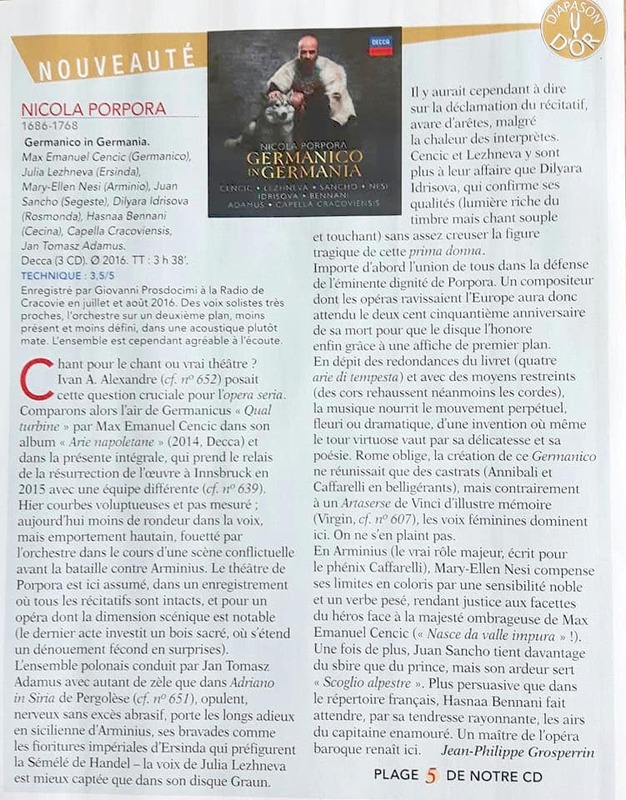 In its March 2018 issue, the French opera magazine Diapason has awarded the newly released CD Germanico in Germania (opera by Nicola Porpora) with their prestigious Diapason d'Or. CD Germanico in Germania is on sale! On January 12th, 2018, sales of the CD Germanico in Germania started. The release date of this Decca recording of Nicola Antonio Porpora's opera coincides with the 250th anniversary of the composer's death. The CD Ottone, produced by Parnassus Arts Productions and Il Pomo d'Oro and pubished by Decca, was nominated for a Grammy in the category "Best Opera CD of the Year". The other CDs nominated are: Berg's opera Lulu with The Metropolitan Orchestra, Berg's Wozzeck with the Houston Symphony, Bizet's Les Pecheurs des Perles with the Metropolitan Orchestra, and The Golden Cockerel with the Marinsky Orchestra. Our thanks for the great cooperation go to Max Emanuel Cencic (Ottone, artistic concept), Ann Hallenberg (Gismonda), Lauren Snouffer (Teofane), Pavel Kudinov (Emireno), Xavier Sabata (Adalberto), Anna Starushkevych (Matilde) and, of course, George Petrou (conductor) and Il Pomo d'Oro (orchestra). We also thank sound master Jakob Händel, and editor David Vickers. Ottone wins the "Preis der Deutschen Schallplattenkritik"
The German "Preis der deutschen Schallplattenkritik" goes to Ottone. We are glad and thankful. Unbelievable, but true: Max' birthday and 35th stage anniversary, all at once! It all began 35 years ago, in what is today called HNK, the opera of Zagreb. Max Emanuel Cencic sang the coloratura of Die Koenigin der Nacht, went on tour with Paris' Sorbonne at the tender age of 7, and started performing infants' roles at the opera of Zagreb on September 1982. To celebrate Max' 35th stage anniversary as well as his birthday, the opera of Zagreb will organize a gala event on September 21st, 2017. There, the artist will perform the title role of Orfeo in Christoph W. Gluck's Orfeo ed Euridice, under the baton of Maestro Niksa Bareza. The Opera Magazine has selected Parnassus' Ottone as "opera of the month" (August 2017). However it is surprisingly rare to see an entire recital dedicated to his work alone. Zelenka is known for his use of harmonic structures that were seen as quite audacious for his time and he composed often extremely demanding pieces, both technically and musically, ranging from unrelenting virtuosity to the most delicate and diaphanous of melodies. Release of the CD Ottone on May 26, 2017. Pre-release starts now! The brand new CD Ottone (opera by George Friderick Handel) with star-countertenor Max Emanuel Cencic in title role and produced by Parnassus Arts Productions has been released through Decca on May 26th, 2017. The CD Ottone can be ordered here. and on April 14th at Festival Biarritz , accompanied by Ronan Khalil. See more details in the schedule.